Today, Greta Stamper, Au.D., Ph.D., is a doctor of audiology in the Department of Otorhinolaryngology at Mayo Clinic’s Florida campus. But her connection to Mayo Clinic dates all the way back to her childhood. 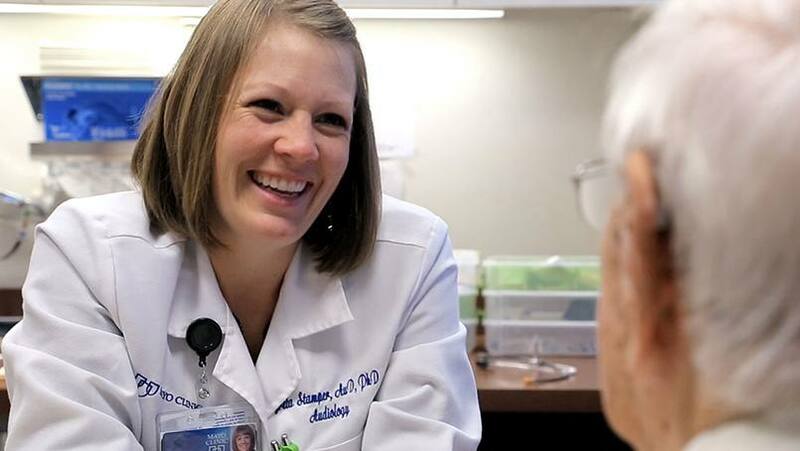 Growing up in Iowa, Dr. Stamper was introduced to Mayo at age 10, when her parents took her to see Michael Schultz, Au.D., an audiologist in the Mayo Clinic Health System. Diagnosed with a bilateral sensorineural hearing loss at age 8, she had made many visits to hearing health care professionals before she met Dr. Schultz. But he was different. “Dr. Schultz was the first person who I could actually talk to about my hearing loss, and he helped me tremendously throughout my adolescence when I struggled to accept my hearing loss,” says Dr. Stamper, recalling daily challenges with peers who didn’t realize she had difficulty with her hearing. With Dr. Schultz’s encouragement, Dr. Stamper went on to pursue a career in audiology, graduating in 2009 from the University of Iowa with a doctorate of audiology. Then she was selected to complete a one-year audiology externship at Mayo Clinic School of Health Sciences in Florida. The school, which began in 1973, now has more than 100 programs in Arizona, Florida and Rochester, representing more than 60 health care professions. The audiology program is available at all three locations. In September 2014, Dr. Stamper came full circle — returning to Mayo Clinic’s Florida campus as a member of the Mayo staff and director of the Audiology Externship. Learn about Audiology and Otorhinolaryngology at Mayo Clinic. Explore Mayo Clinic School of Health Sciences.